Microfinance has become a significant enterprise in developing countries. The microfinance model loans small amounts ($100 -$500), often too small for a bank, to individuals to improve / expand their businesses. To participate in a microfinance organization, individuals come together to manage savings, loans and payments. Each group decides who and how many can join (anywhere from 8 – 20 members). Members hold each other accountable for saving money, developing sound business plans for loans, and repayment of the loans. Many of these groups also develop strong personal ties, encouraging and supporting each other during difficult times. God has used the Life for Children Micro Enterprise Development Department (MEDD) to change the lives of people like Doris. Doris is a member of the Stable Parents Guardian Group. She taught herself how to sew on a treadle sewing machine and started a business making school uniforms. 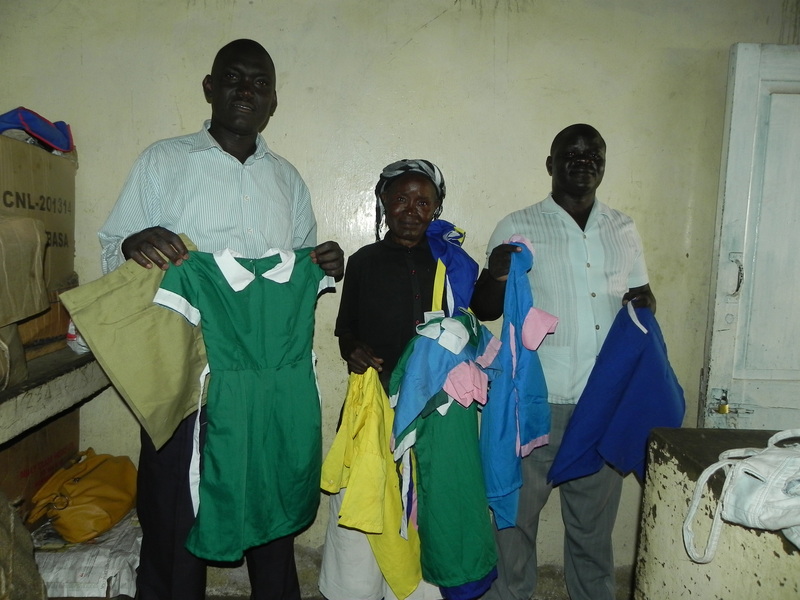 A visiting mission team from Wesley UMC in Evans, GA. met her in the summer of 2013 and bought some of her school uniforms to bring back to the U.S. This purchase allowed Doris to repay her first loan and obtain a second loan. Since that time, she has been steadily increasing her stock. Doris does her sewing at home and brings her wares to the market in Kisumu. She shares a stall area just outside the Kisumu City Market. Her enthusiasm at showing her stock shows how much her self-esteem has soared because of her business! The Obunga Women’s Group has 18 members. These women have developed this group into much more than just a micro-finance accountability group. These women meet once a week to review the micro-finance data, but they also meet another day during the week to support each other. They meet at a different house each week and the host shares about what is going on in her family’s lives. This group also maintains a welfare kitty to use when a member needs extra help. Jennifer Anyango is a guardian with Life for Children and is the treasurer of the Obunga Women’s Group. Jennifer has four children; after her husband died, she was not treated well by his family so she came back to live with her mother and sister. Jennifer buys corn each day, boils it and sells it. She has paid back two loans and has applied for a third loan. 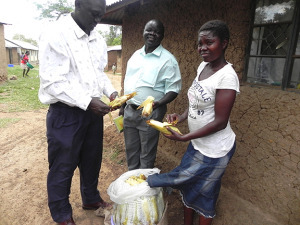 She has increased her family’s income with her business and provided the initial funds to allow her mother to also buy corn to boil and sell. She attempted to branch out into selling rice, but that did not turn a profit. Now she is planning to add buying and selling used clothing. She and her mother support eleven people in their household. When Jennifer left her in-laws, she was a marginalized young widow with low self-esteem and little hope. Through the Obunga Women’s group and the microfinance program, she has become a self-confident young woman who knows she can provide for her family. Pius (pronounced Puce) is the chairman of the Tekchuali microfinance group. He has been in business about 14 years and has participated in several microfinance programs. He started his business 14 years ago by selling kitchen supplies: plastic tubs and bowls, etc. About 10 years ago he switched to used metal. Pius’ wife sells dry beans, corn and grain in another market. They have 4 children, the oldest in class 7 (7th grade). He’s used the microfinance loans to expand their businesses using 25% of the loan for his wife’s business and 75% for his business. His goal is to continue to grow his business by moving from a ground plot to a shop stall.